Last week, the Royal FloraHolland Winter Fair took place in Aalsmeer, the Netherlands. This trade fair at the start of the new year provides an overview of what's to be expected in the coming season. Around 60 growers were present to present their products. 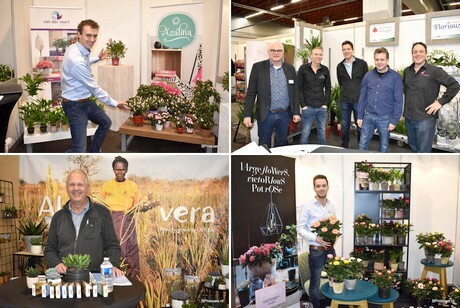 Clockwise: Luc vd Sar of Van der Voort presents their Azaleas; Jan Ekelmans of Boomerang, Jeffrey vd Berg of SunShine Grow, Jaap Rip van Bromini, Huub Custers of Custers Plants and Michel v. Rijn of Flamingo Plants; Erik Bos of Nolina presents de Lenora. The plant growers - both the tropical and garden - have had a good 2018. The pansies season have had a terrible start, but all others did quite well. Regarding indoor plants, it is known that it has been a challenging year for the orchids. In contrast, the green plants are still booming. "We have to be there", the loyal visitor of the trade fair says, "because a new year means a new mindset". The holiday cheer is behind us now and this means a chance for plant growers to replace the spot of the Christmas tree with something green or flowering.